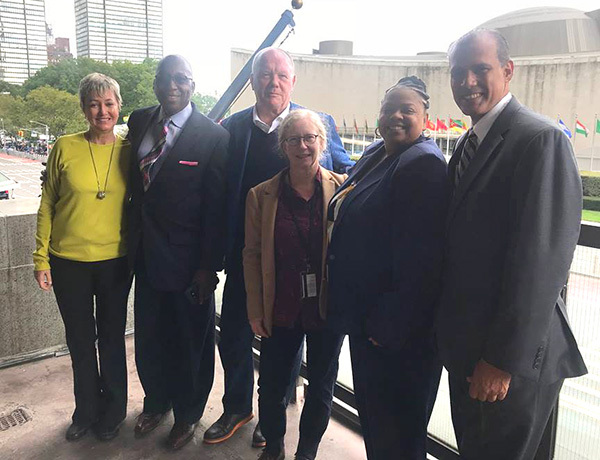 On Monday, bank workers and members of the Committee for Better Banks, a CWA project, joined a side meeting at the United Nations to discuss how workers having a voice on the job can make the finance industry more sustainable and inclusive. Panelists discussed how American bank workers' lack of collective bargaining power has led to stagnant wages, sharp rises in income inequality, and more financial instability. "Today, while governments from around the world try to convince financial firms to reverse course and finance sustainable development, we are here to say that the first step on that path is to respect the human rights of their employees, who make their profits possible," said Jerry Robinson, a Committee for Better Banks member who worked at Santander Consumer USA for six years. The event was sponsored by the Friedrich-Ebert Stiftung-New York Office and UNI Global Union, and hosted by Ambassadors of Luxemburg and Uruguay. On Monday, bank workers and members of the Committee for Better Banks, a CWA project, joined a side meeting at the United Nations to discuss how workers having a voice on the job can make the finance industry more sustainable and inclusive. Sep 27, 2018 - Major Wins in New FAA Bill!